During August 2016 we gathered to read and discuss the Epistle to Philemon. This short letter, written by St. Paul, is only one chapter long. 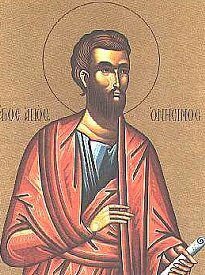 Onesimus was a runaway slave of Philemon who was converted to Christianity by the Apostle Paul. In this letter Paul writes Philemon with the hope of reconciling the two men. The letter has an interesting history in that it has been used to support slavery, as well as to support the abolition of slavery.